Weekly Happenings: It’s crazy to think that there are only four more days until Christmas! It has definitely been fun watching Joseph enjoy the holiday season. 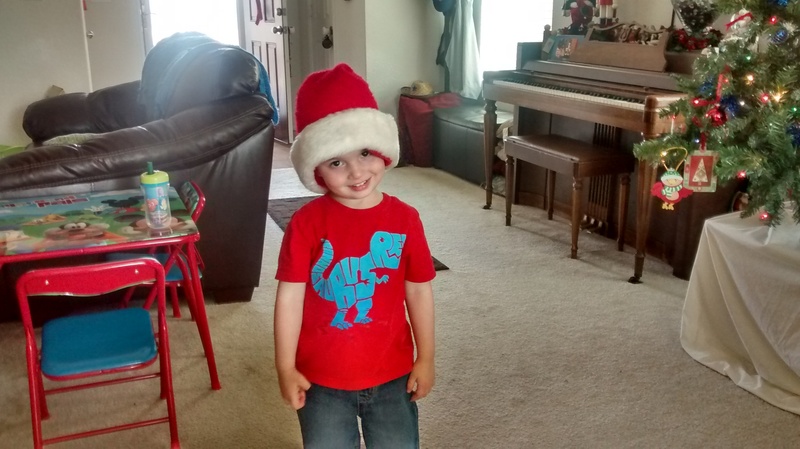 He loves turning the Christmas tree lights on each morning, switching the day on the Santa countdown, and taking a link off of the “countdown to Grandma and Grandpa” chain. He gets excited about presents, even if they aren’t for him (he loves watching people open presents) and asks on a regular basis if it’s time to see Grandma and Grandpa (almost, kiddo, almost). We had another pretty low-key week, mainly because I’m getting everything ready for seeing family. 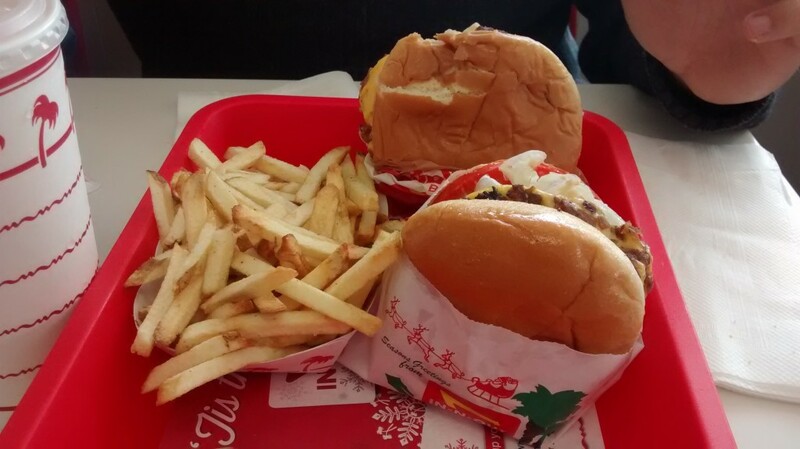 We did finally get to go the the In N Out that was recently built out here. 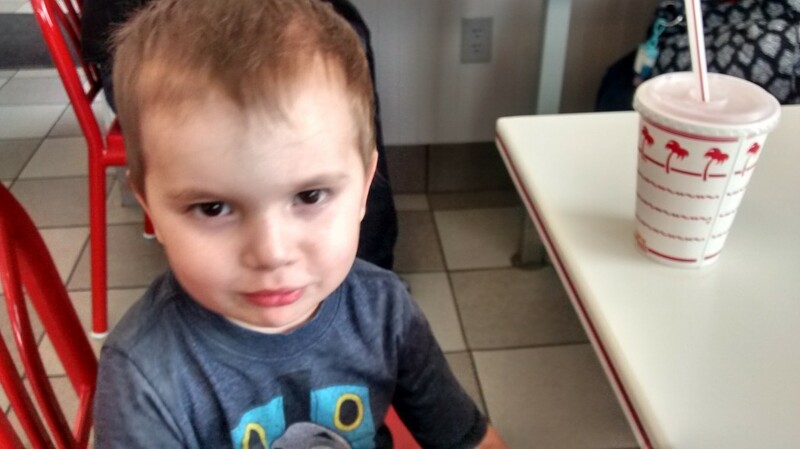 Paul took this past Thursday off (he needed to get fingerprinted for his CHL) and we were in the area during an off-time (though the drive-thru was still crazy). We found a seat almost right away and only had to wait about 5-10 minutes for our food. It was so yummy! Oh, and Friday was a fun day. We had friends over to play games and our group of friends surprised us with presents that were very meaningful to us (and had to do with the game that we play, so that was even better). The gifts were a mixture of stuff for us and stuff for Joseph. Joseph got some plastic frogs (Paul kept the spooky skull cup they came in), a Barrel of Monkeys game, a big fuzzy plush spider, and a copy of the book Dragonology. Other gifts were a flashlight, some gummy bugs in a mixture of Oreo “dirt”, and a couple of gift cards to Home Depot and HEB. We were not expecting anything like that (they said they wanted to thank us for hosting game night for the past couple of years) and were overwhelmed with their generosity. The Weekly Weather: Kind of a rinse and repeat of last week: sunny and cool with a few cold and rainy days mixed in. I guess that is one of the reasons I have a hard time remembering that we are still technically having a drought because it rains frequently (just not very much at a time for most of the storms…a couple of times it’s a really big storm, but we didn’t have any of those this past week). What Paul’s Been Up To: This past week was his last week of classes for the semester, so he was busy taking tests and finals. He also ended up spending some unwanted quality time with our server yesterday since the software update that was supposed to go routinely…didn’t. The server flipped out and he had to spend a lot of time recovering, restoring, and backing stuff up. I’m so grateful that he is so knowledgeable in that area!! What Sarah’s Been Up To: I finished up my last week of students (we’re taking two weeks off because of the holidays) and I have been kind of enjoying not having to think about anything choir or visiting teaching related (choir is taking a break until at least after the holidays and I don’t have to make any changes to visiting teaching until then as well). I’ve been getting ready for our family visit in stages so that I don’t get too stressed out. One of my awesome friends is going to take Joseph for a couple of hours tomorrow so that I can get some stuff done while being kidless. I see some cookies or something in her future! What Joseph’s Been Up To: The highlights of his week were our trip to In N Out (where we discovered that his love of onions extends to grilled; we knew he liked raw and sauteed onions, but he hadn’t tried grilled yet…he loves grilled onions), getting to play with the new toys our friends got for him, and going to a friend’s birthday party (I neglected to get any pictures from the party…I didn’t even think about it) yesterday. 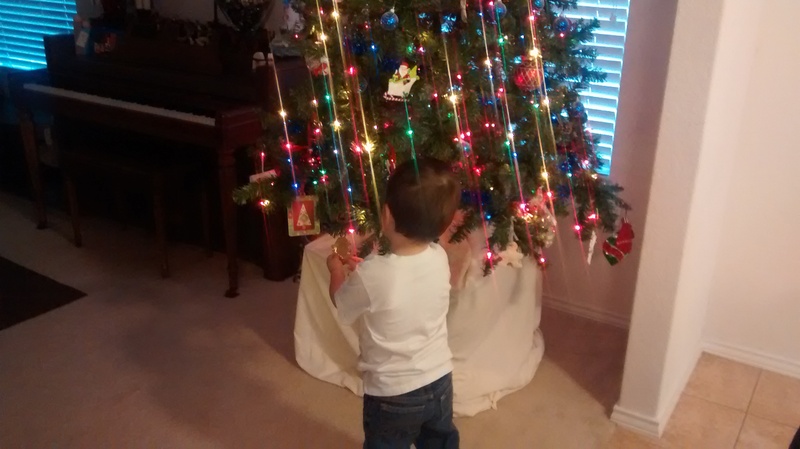 The rearranging of ornaments on the bottom part of the tree is a continuous, ever-evolving process. 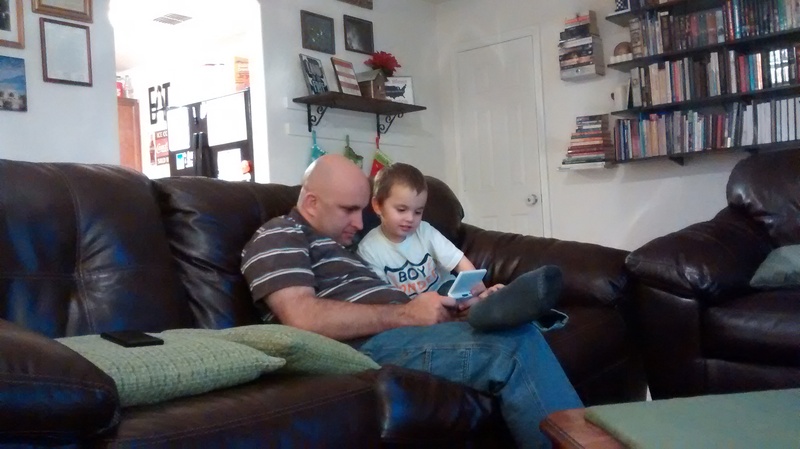 Joseph likes to play Mario Brothers on Paul’s old DS. Occasionally he wants help with a hard part, so he’ll walk up to Paul and say, “I help you?” which actually means, “Will you help me?”. Perhaps he’s heard me say “Can I help you?” too many times. I liked this artwork a lot. 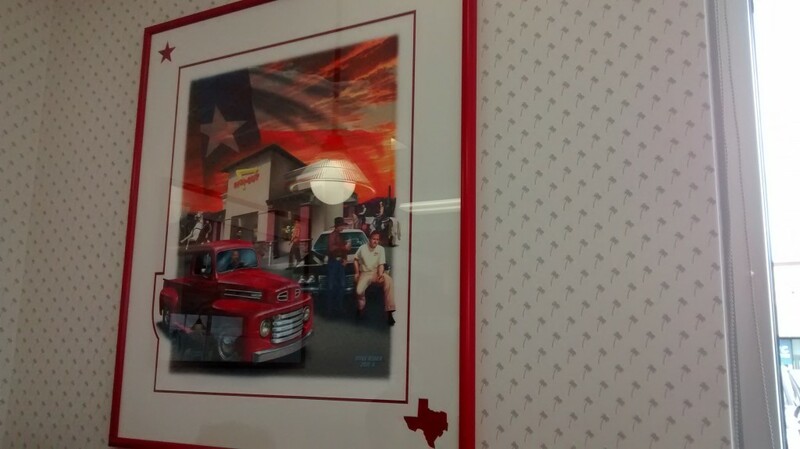 It’s a really good mash-up of the classic feeling of In N Out and Texas. Yes, I took a picture of our basket of yumminess. 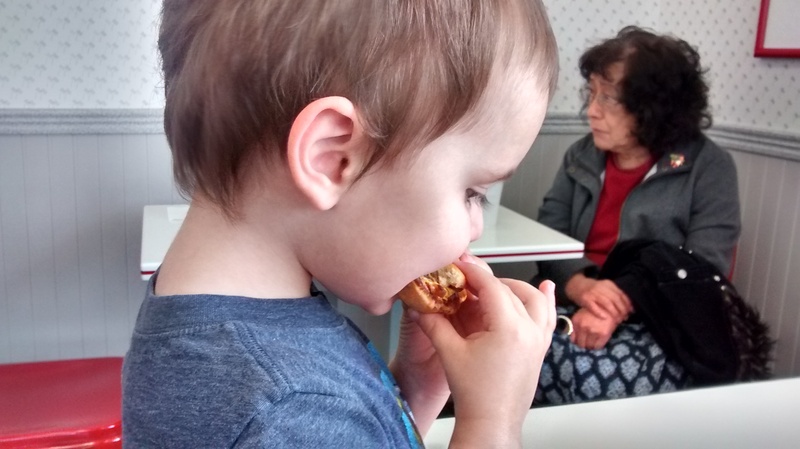 Joseph chowing down on his cheeseburger (he didn’t want the lettuce and tomato, but he was fine with the cheese, grilled onions, and sauce). I love the pointed-out pinky…so proper, lol. He wanted to read to me…so he climbed up with a book, told me I needed to listen to him, and started telling me about the pictures. I got my Christmas present early (my boots), so were able to get Paul his present a bit early as well. 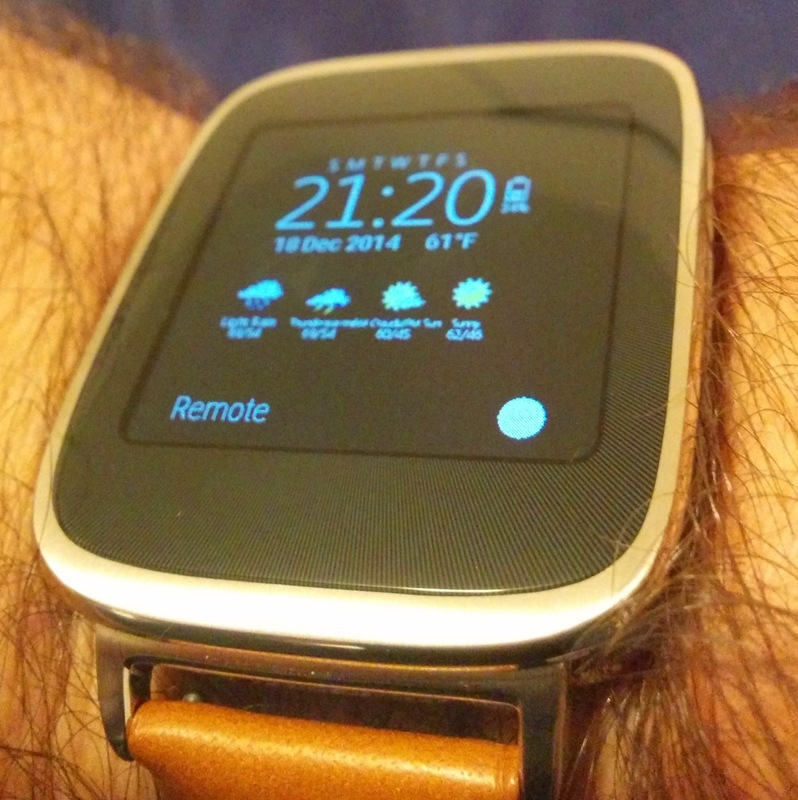 It’s a smart watch. It does all sorts of cool things! 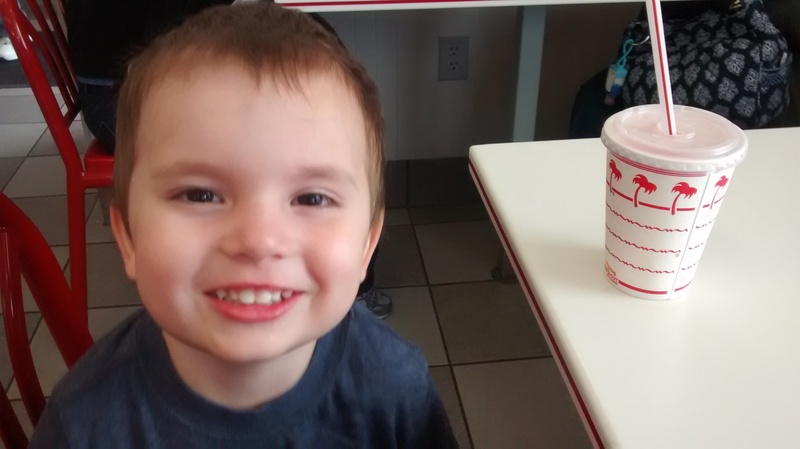 He was very excited to get it. 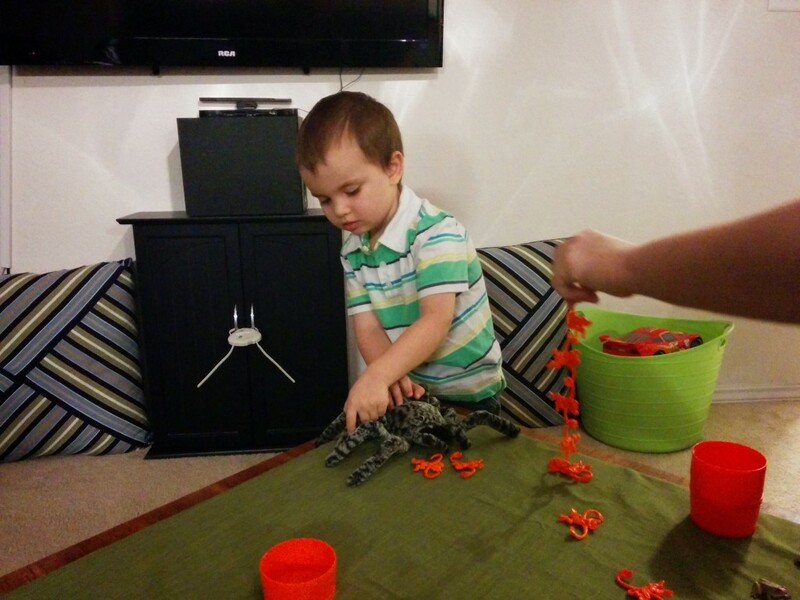 Here’s Joseph playing with his spider and frogs. 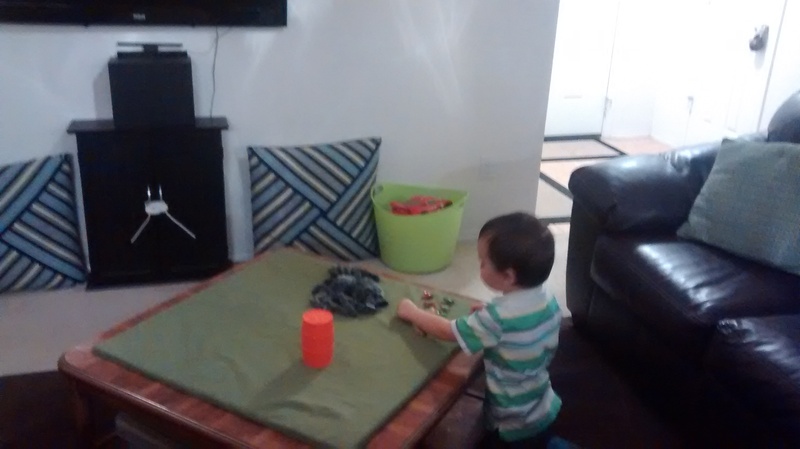 He was making the spider chomp the monkeys. 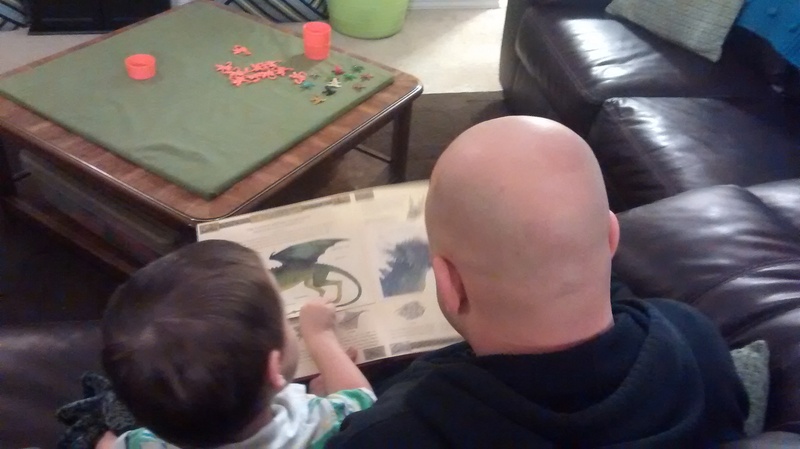 Looking at Dragonology with Daddy. 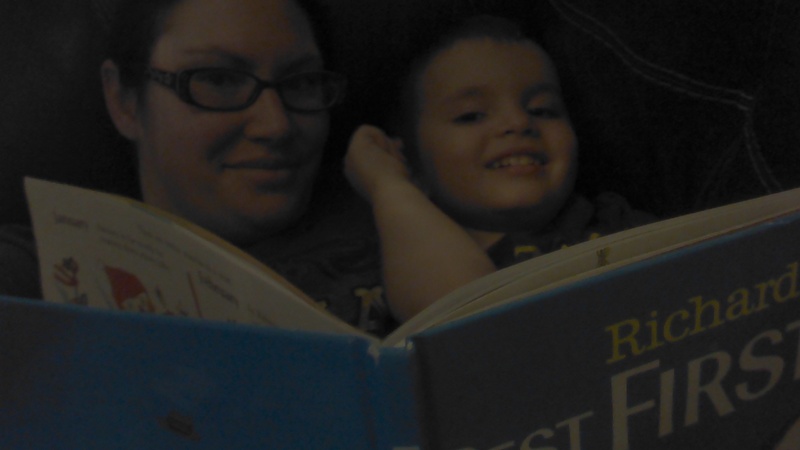 It is a REALLY cool book. 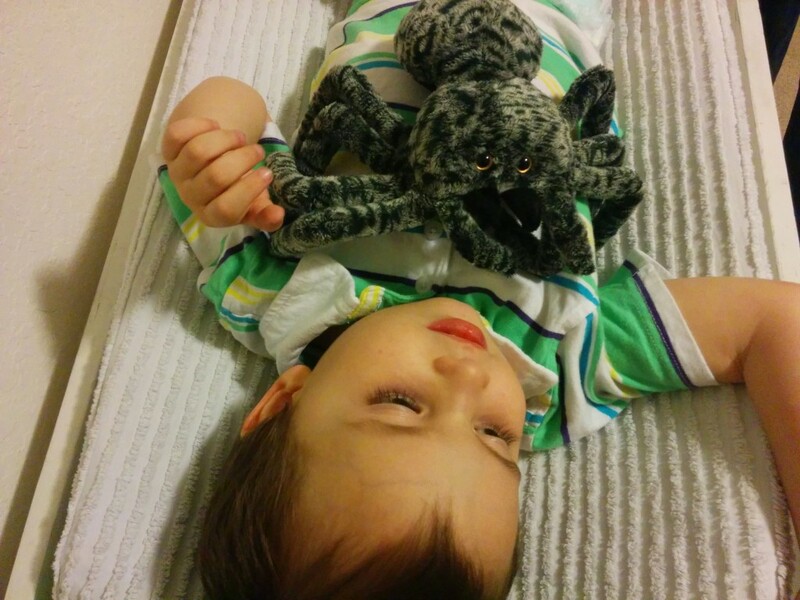 That spider has been with him everywhere (even during diaper changes, lol). He has decided that the spider is a boy and his name is Stripey.